Mike Borgatti came into that August 1989 game with two on and one out. He also had a two run lead, according to The Frederick News-Post. By the time Borgatti was done, his Frederick Keys won by that two-run margin, Borgatti inducing a pop-up and getting a strikeout, according to The News-Post. "It's what I have been doing since I came here," Borgatti told The News-Post after his seventh save on the year. "You just go in there and take one pitch at a time." Borgatti was in his fourth season of doing that, working as both a starter and a reliever. He would play in just one more. He would also never make the majors. Borgatti's professional career began in 1986, signed by the Orioles as an undrafted free agent, out of Tulane University. With Tulane, Borgatti started 16 games in 1986, still tied for the second-most starts in a season in school history. The previous year, Borgatti completed eight games, still tied for 8th place. With the Orioles, Borgatti started at short-season Newark, getting 16 outings, five starts. He also won six, saved three and posted an ERA of 2.01. 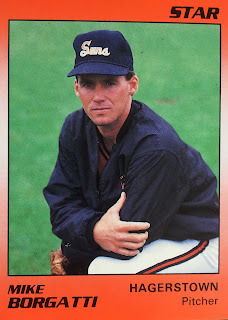 He moved to single-A Hagerstown for 1987, going 5-5 in 27 outings, 19 starts. For 1988, Borgatti split time between Hagerstown and single-A Virginia. Between them, he was 6-11, with a 4.13 ERA. In June 1988, Borgatti threw one of his six complete games on the season, giving up six hits with Virginia in a win over Prince William. For 1989, Borgatti split time between single-A Waterloo and single-A Frederick. At Frederick, he went 7-0, with a 0.86 ERA in 23 relief outings. He also earned a one-game look at AA Hagerstown. Borgatti played just one more season. He returned to Hagerstown, then moved to the Indians system, playing at both high-A Kinston and AA Canton-Akron, ending his professional career.